Dry skin is certainly no laughing matter, and those who suffer from it can find that dealing with it and keeping it under control is a difficult task. There are a variety of factors that can contribute to dry skin- including stress, diet and environment- as well as underlying skin conditions. Itchiness is one of the main characteristics of dry skin- although it is important for sufferers to try to refrain from itching, as it can make the condition worse. Persistent dry skin on the face can have lasting effects, and the appearance of fine lines can be very ageing. This is why dry skin needs to be dealt with quickly and effectively. Once you’ve determined the cause of your dry skin you need to take steps to tackle it. Drinking plenty of water is known for being beneficial to skin and keeping it dehydrated and is a good starting point. Investing in a moisturiser specially designed for very dry skin is also essential. 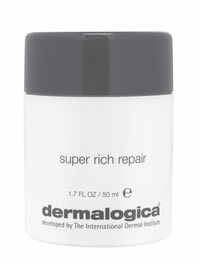 Dermalogica Super Rich Repair is fantastic for parched skin, and not only does it provide much need intense moisture, it also helps to reduce the appearance of fine lines that may have started to appear. Demolish dryness and reveal smoother, supple skin.